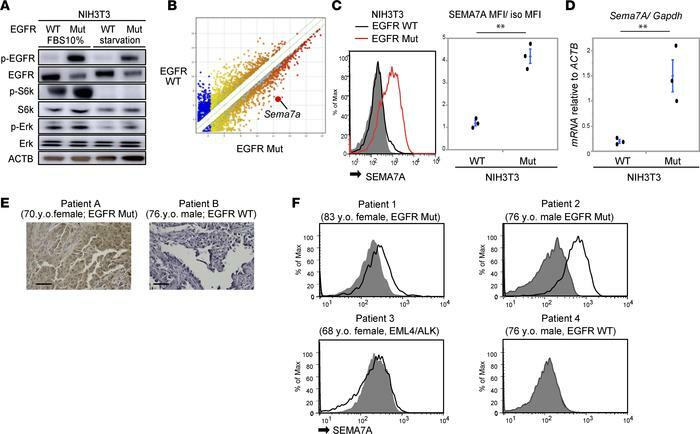 Oncogenic EGFR signals induce SEMA7A expression in mouse fibroblast cells, and SEMA7A is expressed in human lung adenocarcinomas. (A) Representative immunoblots showing that p-EGFR and p-S6K are upregulated in medium containing 10% FBS. Under starvation conditions, p-Erk level is higher in EGFR-Mut than in WT EGFR–NIH3T3 cells. Data are representative of 3 independent experiments. (B) Microarray expression profiling of NIH3T3 cells stably expressing WT or Mut EGFR. (C) Confirmation of SEMA7A upregulation by FCM in EGFR-Mut-NIH3T3 cells. Left, representative of 3 independent experiments. Right, data (means ± SE) are representative of 3 independent experiments. The 2-sample t test was used to evaluate significance. **P < 0.01. MFI, median fluorescence intensity; iso, isotype control. Gray area indicates the isotype control. (D) qPCR confirming upregulation of Sema7A in EGFR-Mut–NIH3T3 cells. Data (means ± SE) are representative of 3 independent experiments. The 2-sample t test was used to evaluate significance. **P < 0.01. (E) SEMA7A IHC of human lung adenocarcinoma samples. Scale bar: 50 μm. (F) SEMA7A FCM of CD45lo cells in malignant pleural effusions associated with human lung adenocarcinoma. Gray areas indicate isotype control.